I was skeptical about this tip when I first saw it several months ago. I felt stupid trying it. But I have to say, after getting excellent results from the same disposable blade for the last five months, it really does work. You read that right by the way; five months of weekly use from one disposable razor blade cartridge. In my case, it's the Schick Extreme 3 which was 75% off at King Soopers. I bought about 40 cartridges, enough to last me at least a year. But at this rate, I'll be using them when I retire! Anyway, they have a lot of flexibility and thus are perfect for hugging the contours of my head. Yep, I'm up there with Lex Luthor as fair as haircuts go. After I unpacked the razors, I did a little web browsing and found a video that made one heck of an outrageous claim. 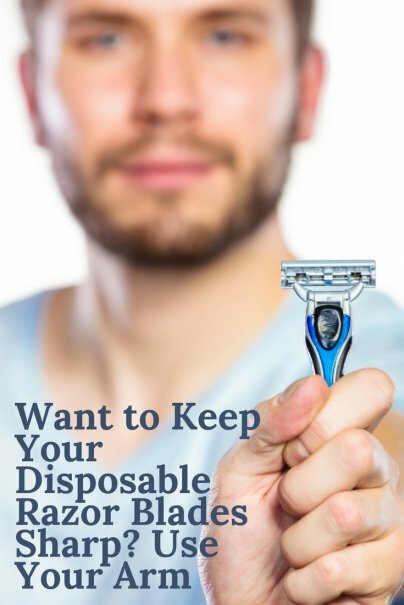 It was hosted by a soft-spoken guy who claimed that with his two simple tips, you can make your disposable razors last for years. Not months, years. The first tip is one I was already doing — dry the blades on your towel after you're done. This is a no brainer. The second tip seemed somewhat bizarre — when your razor blade appears to be getting a little dull, rub it backwards about 10 times on your arm. The skin acts like an old-fashioned leather strop and sharpens the blade! Now you know why I felt a bit dopey. At first, I thought it was an April Fool's gag (and what a good one it would have been if it were fake). But over the past few months, with my razor performing as well as the first time I took it out of the package, I have to admit that it works 100%. I'm no math whiz, but with cartridges costing around $10-$20 for a four-pack, those two little tips will save anyone who shaves quite a bit of cash. So give it a try, and come back and tell us how long your razors last. Maybe you'll break a record. in general; razor blades dull from corrosion. in the olden days, the strop (made of tanned hides) were lubricated with an oil and it was the presence of the oil that 'saved' the blades. (they do also lightly polish the surface of the blade). drying the blade (blotting on towel) is a good first step. a light coating of mineral oil will be next. as i recall; someone is selling 'blade oil' made of sunflower or safflower oils (can't remember); if you've got the cash -- stimulate the economy! or, you can be a real man (or woman); give your blade a shot of WD40 after each shave. your pain tolerance can be inversely scaled to the volume of your screams after your next 'nick. I think the jeans trick works better. 8-10 strokes on a pair of jeans, both up and down works great for me. I've been giving this a try since it first made the rounds on the interwebs (March-ish)... I have to say, it does help to keep a pretty good edge for a while. Its not quite as nice as a brand new blade, but it is certainly doable. I've changed my blade once in that time, but only because it got damaged in a move. Alternatively, you can do what some other people do - run it backwards about 10 or 15 times on strip of denim. We have a piece of denim from a destroyed pair of jeans in the bathroom. My SO has been using the same disposable razor daily since early March. Still shaves like new. Maybe dirty denim would work better, because dirt in the fabric would be an abrasive. Dirty denim would probably be bad as it would damage the blades. The idea here isn't to resharpen the blades, it's to realign the edges at a microscopic level. Same would work for a dulling knife. When new the edges are aligned straight. As used they go from being a straight line to looking Bart Simpsons hair (all the points in different directions). Dragging the blade across a surface realigns them. I switched from the Fusion blades to old-fashioned double-edged safety razor blades. Costs about $15-$20 for a pack of 100 blades, so about twenty cents a blade. They take some getting used to after using a Fusion, but I learned how to shave with them and I love them. I don't feel like I have to squeeze every penny out of them like I did with the Fusions, so I replace them whenever I want. Only small downside is they sometimes get confiscated at airport security, but oh well. Then if you have checked baggage use that to hold your razors. Or if visiting family or friends then buy a razor in that town and leave it for your next visit when you only have carryon luggage. If you are on vacation then buy the cheapest brand your skin can tolerate and hope it isn't confiscated. C.
I've heard keeping the blades covered in rubbing alcohol is good too. I'm just lazy with shaving my legs so my blades last a while. I've been using the arm trick for months now too, since seeing that same video. And it seems to work for me. Not a single blade replacement needed yet! Wow. I admit, this sounds a little far fetched to me too, but I will definitely try it next time I shower. Having to go through disposable razors certainly adds up. Clean it with rubbing alcohol (70%-91%) after every use using a cotton swab. You will clean it, disinfectant and keep it sharp all at the same time! Excellent find! I hope this actually works, because there is nothing worse than replacing those blades every couple of months. I've been just using my old blades as long as possible, putting up with a less than comfortable shave. I'm going to give this a try and see how it works! While I enjoyed the tip and will try it for fun, I rather play it safe when it comes to shaving, though I usually dip my razors in olive oil. i just grow stubble and don't think i could ever achieve a proper beard/moustache. i use a blade shave once a week and an electric shave during the working week, just not enough time to blade shave in the morning. my cheap disposable blades can last me for months just by keeping them dry, i always use a hot towel on my face before shaving and it has always worked fine. i like the trick about running the blade over your arm etc, i have no doubt it extends the life of the blades. keeping the blades dry seems to work for me and my stubble. I will include this in my morning routine! BTW, King of shaves can be roughly duplicated by doing a 3:1 ratio of Castor oil and Olive oil ( you can add some drops of essential oil like peppermint ). Rarely do I nick myself! this does work, I do this along with a towel and jeans, I swear i'm using the same mach 3 blade, for 23 months now with no signs of dulling. don't believe me? good ! try it then argue with me. I have no monetary interest in this . just trying to save you money, ask yourself why, Gillette fusion blades have to cost $5.00 apiece now really $5.00 each lol what fools we were.